The OUTshine Film Festival in Miami is celebrating two decades of bringing world-class films to its attendees, April 20–29. Like most LGBTQ film festivals around the world, OUTShine aims to “inspire, entertain, and educate” with its diverse array of film, video and other media. We know that film festivals, especially those as diverse as the OUTshine Film Festival, can be daunting when trying to ascertain which screenings and showcases are really worth your time. So we enlisted help! We asked the curators of OUTshine Film Festival themselves to fill us in on the seven films, parties and programs they think are not-to-be-missed during this year’s 20th annual festival. Our opening night film, My Big Gay Italian Wedding, is a film adaptation of the stage play of the same name. We’ll have two of the star actors, Cristiano Caccamo and Diana del Bufalo, attending. We’ll also be honoring Kit Williamson and John Halbach, creators and stars of the Netflix series The Eastsiders, with our Vanguard Award for being trailblazers in bringing LGBTQ film and television to the mainstream. We’ll also be awarding Dreya Weber, longtime LGBTQ actress and star of the women’s short film Getting Started. Postcards from London is a fun flick about a young man who moves from the suburbs to SoHo and falls in with a slick gang of male escorts called the Raconteurs. With beautiful cinematography and a twisting storyline, it’s a perfect film to see with friends and wind down the week. 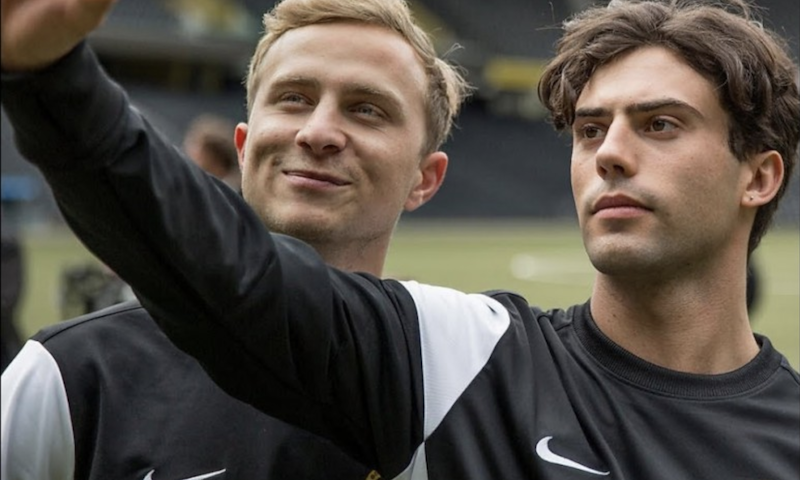 Mario is the story of a professional football player in Switzerland who falls in love with his teammate and has to choose his between being in love and being out … or keeping his relationship secret and prioritizing his career. The stories of LGBTQ professional sports players are rarely told, and this film takes a unique look at the repercussions they can (and often do) face by being themselves. OUTshine’s Men’s Short Films Program is a great way to watch clips from up-and-coming filmmakers. This year’s short films program includes six different works that cover a range of themes, including one from Golden Globe-winning executive producer Rachel Brosnahan. The Men’s Spotlight film is a documentary about the famous fashion illustrator Antonio Lopez, who had a profound impact on the fashion industry in the 1970s. This documentary tells the story of his life through interviews with iconic models like Grace Jones, Jessica Lange and Jerry Hall. Anything is a heartwarming film featuring Hollywood star Matt Bomer. The movie follows a man recently widowed from his hometown in Mississippi to be closer to his daughter in Los Angeles. He forges an unlikely friendship with his neighbor, a trans woman, and shows the importance of breaking down barriers and building bridges. Featuring an impressive cast that includes Cory Michael Smith (of Gotham), Virginia Madsen and Michael Chiklis, 1985 follows a closeted young man as he travels home to Texas from NYC and grapples with how to divulge his dire circumstances to his religious parents and estranged childhood friend. Check out the rest of the OUTshine Film Festival program here. The Ft. Lauderdale iteration of OUTshine Film Festival will take place Oct. 12–21.